McComic | Comics I Don't Understand - This site is now being updated daily at http://www.comicsidontunderstand.com. Please change your bookmark if necessary, and notify any web site with a link to the old address. The term for large houses in new developments is sometimes McMansion. 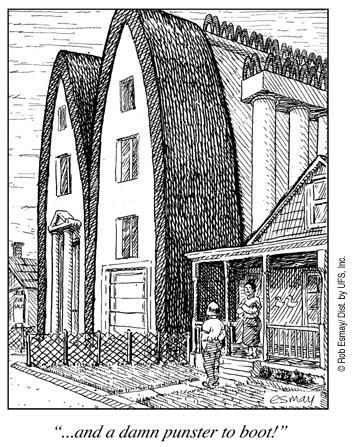 Although, the neighbors don’t seem to have that large of houses. In Atlanta, much complaining – and some legislation – has come of people buying small homes, leveling them, and squeezing McMansions on the property (often with mere feet between the exterior and the next property). Old McDonald had a farm…damn punsters. Yep a literal McMansion on what looks like a tear down lot. Most new construction around me is done on lots of houses built in the 50’s. Thanks for the insight ctdonath and John. That explains the neighbors’ homes.